I find myself cooking with chicken a lot because both Chris and Bradley really enjoy it. Actually, there isn't much that my two boys don't like, but since chicken is easy to make and is always on sale, it's one of my go-to's. I guess I'm pretty lucky that I don't have picky eaters on my hands, especially since our menu is different every.single.night. I guess that's what happens when your wife/mom has a blog to maintain! Part of the reason why this recipe is so easy is because the chicken is popped under the broiler to cook, and therefore only takes a few minutes. 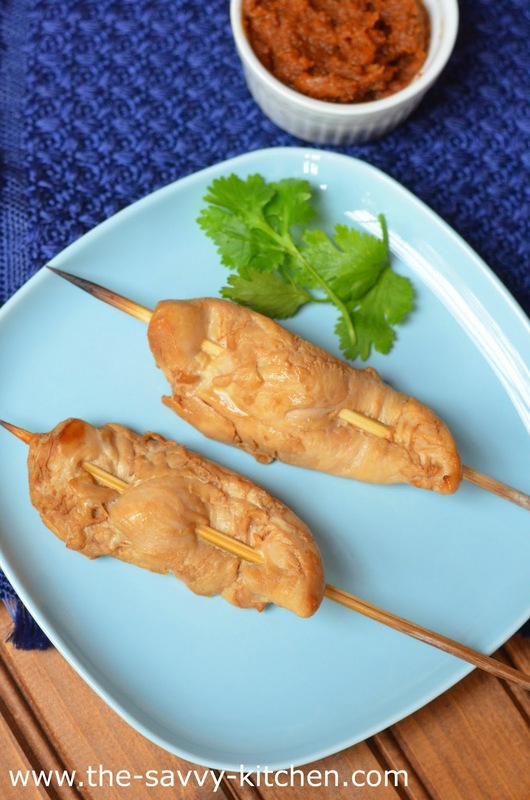 The marinade that the chicken sits in before cooking really gives the chicken a lot of flavor, while the dipping sauce is a healthy combination of peanut butter and soy sauce, but gets some saltiness from the hoisin sauce and a little acidity from the lime juice. It really is a perfect combination and a super easy weeknight meal. Enjoy! Mix the marinade ingredients in a small bowl. Add chicken tenders and allow to marinate for 30 minutes. Meanwhile, soak bamboo skewers in water for at least 20 minutes. Preheat broiler to 400 degrees. Line a baking sheet with aluminum foil and spray with cooking spray. Once marinated, thread chicken on skewers. Place on prepared baking sheet. Set under the broiler for 3 minutes. 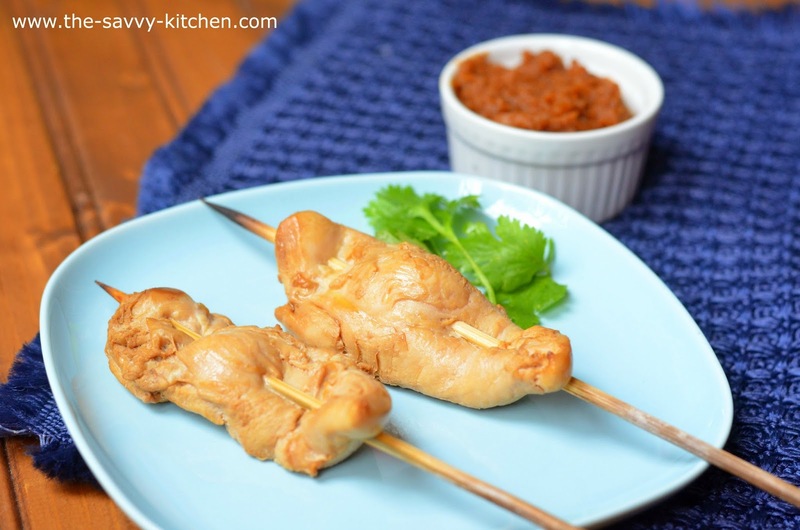 Flip skewers and cook for an additional 3 minutes or until cooked through. Meanwhile, add water, soy sauce, lime juice, hoisin sauce, peanut butters, garlic, cayenne and sesame oil to a small saucepan over medium-low heat. Cook until peanut butter is melted and mixture is combined. Remove from heat. 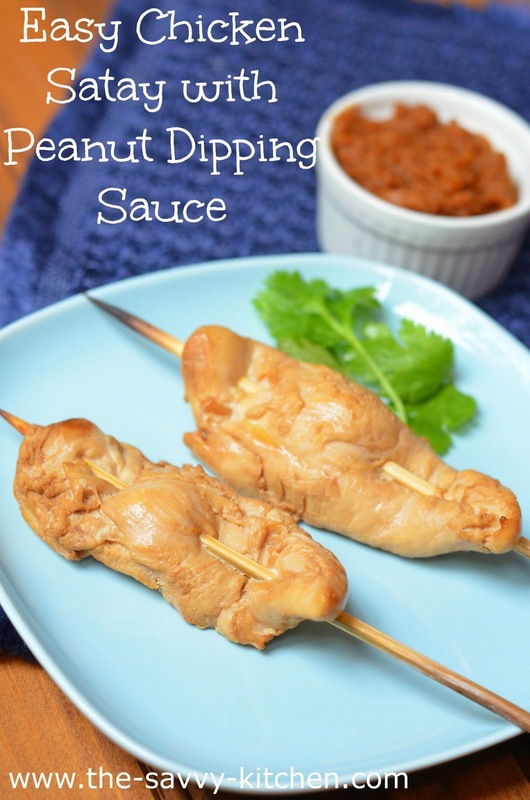 Serve chicken with peanut sauce.